You cannot grow up in New York City without hearing the name or seeing the photographs of Jacob Riis. Some of my earliest memories involve flying a kite at Riis Park, a beautiful Depression Era beach with boardwalk and concession stands along the coastline of Queens,NY. A fitting tribute to a man who was obsessed with the deplorable conditions of the city's poor. What most New Yorkers never hear is the story of this remarkable immigrant who gave a face to poverty and then did something about it. 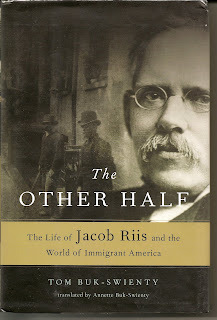 In "The Other Half- The Life of Jacob Riis" author Tom Buk-Swienty (a fellow Dane- like Mr. Riis) has laid before us a complete picture of the life of Jacob Riis. Beginning with his decision to leave Denmark after his true love Elisabeth, of Royal heritage, turns down his marraige proposal and arriving in the United States with no money and no work, Mr. Riis sets out on a journey that will take him across America 3 times before returning to Denmark. In the intervening years he works as a mill hand, a factory worker, in short at all manner of jobs in an effort to support himself and gain the "American Dream." His goal eludes him over and over again. But he begins anew after each failure- sure of his quest- to gain the staus necessary to return to Denmark and claim, as worthy of him, his dear Elisabeth. It is during this time that he experiences the things which will guide his life's work. In New York he is forced by necessity to sleep in doorways and trash heaps. He is awakened one night by the Police who give him a clubbing and when his dog becomes threatening, an officer picks him up and smashes him against the sidewalk, killing him. This treatment of the destitute would haunt Riis forever. Finally saving enough to buy a small, failing Brooklyn newspaper he begins to publish the stories of the underclasses and his experiences as a Police Reporter on the NY Tribune. Returning to Denmark after learning of the death of Elisabeths' fiancee- he is welcomed warmly. But Elisabeth doesn't love him, yet. Theirs was a unique relationship that began platonically and grew, after their marriage, into a full partnership. They return to America and have 4 children. With the advent of flash photography Mr. Riis is finally able to document all that he has lived and seen in his travels throughout the tenements. Writing and lecturing on the photos becomes his work and passion. When his children come down with scarlett fever he brings home a lone dandelion and places it in their room. The result was a complte turn around in the "misery" factor. This leads Mr Riis to conduct a city wide campaign to distribute flowers in the tenements to thousands of chilren whom have never seen one! At this point Riis puts all his efforts together in a book, complete with his now famous photographs. After the death of his wife Elisabeth he marries again, this time to his assistant, 28 years younger. Interestingly their love is a mirror image of his earlier relationship with Elisabeth- platonic at first but later maturing into a deep love and respect for one another. Translated from the original by Tom Buk-Swienty's wife, Annette Buk-Swienty, the book is illustrated with some of Mr Riis' lesser known photgraphs of the tenements. This book will be of interest to anyone that has a stake in Social Welfare or any field dealing with poverty and how we see it and treat it.